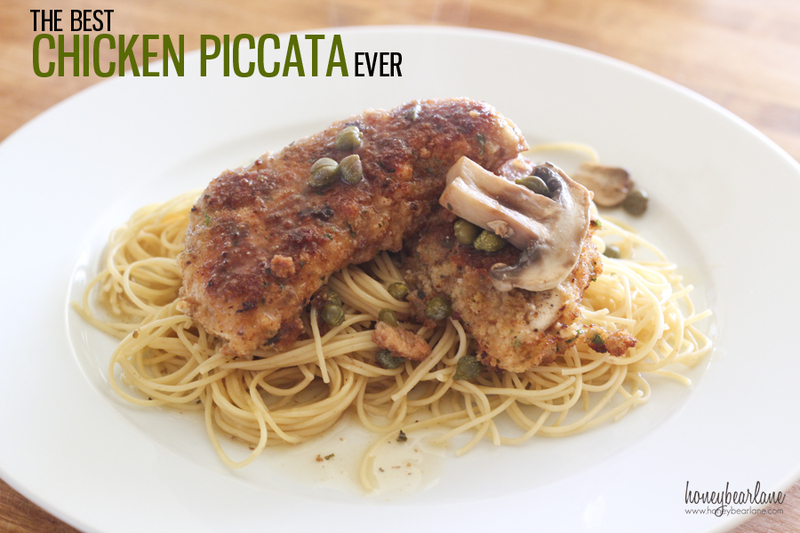 One of my favorite dishes of all time is Chicken Piccata. It’s this breaded chicken served with a yummy lemony sauce, usually with spaghetti or angel hair noodles. I’ve ordered it at tons of restaurants and believe it or not, ever single time I eat it at a restaurant, I think, “Mine is better than this.” Some people like Cheesecake Factory’s chicken piccata recipe but I think it’s all wrong. It’s not breaded and the sauce tastes like pure butter. Too greasy. So if you are looking for a copycat of that, this is not it–it’s WAY better. I think the best way for TASTE is to fry the chicken in a little oil (NOT deep fried.) However, sometimes I will bake the chicken to be healthy. I will give you both options. I also cook the sauce with capers and mushrooms, although sometimes I leave the mushrooms out if I don’t have them or whatever. Either way, I must have the capers because I love them. They add a little zesty zing. I find capers in the aisle at Walmart by the canned goods, by the artichokes and whatnot. Salt and pepper each chicken tender, then dip in egg yolk and bread crumbs. Fry in about 2-3 Tbsp of olive oil, flipping once until each side is golden. Take the chicken out and put in the oven at about 250 degrees to keep warm. Using the same pan, drain out excess oil and then pour in the can of chicken broth (save the reserved), white wine, lemon juice, capers, and mushrooms. Reduce the sauce (letting it boil/simmer) until about half or ⅔ so you will still have enough to pour over the chicken and noodles. Make sure to taste the sauce and alter as you like. Cook the noodles al dente. Serve with chicken and sauce. *Heathy Version: Don't fry the chicken, but cook in a 350 oven for 20-25 minutes. Spray the chicken with olive oil to give it a little crispness. So, do you use white wine? You can also substitute apple juice.